【2月】【ASOS,英国ALLSAINTS羊头,意大利香格里拉皮衣夹克】【599起】 - 蜗居shop商家区 - 蜗居shop - Powered by Discuz! Inspired by late 70s racing jackets and modified with a unique Italian touch, the “Café Racer” represents an authentic garment made of genuine heavy naked cowhide leather. The zippers are made out of metal antique brass and engraved by hand. The attention to details makes it a rare and authentic leather jacket. Designed for bikers, rockers and gentlemen. Runs smaller! Please size up by 1 size! Inspired by late 40s sport jackets and modified with a unique Italian touch, the “Varenne” represents an authentic garment made of genuine heavy naked cowhide leather. 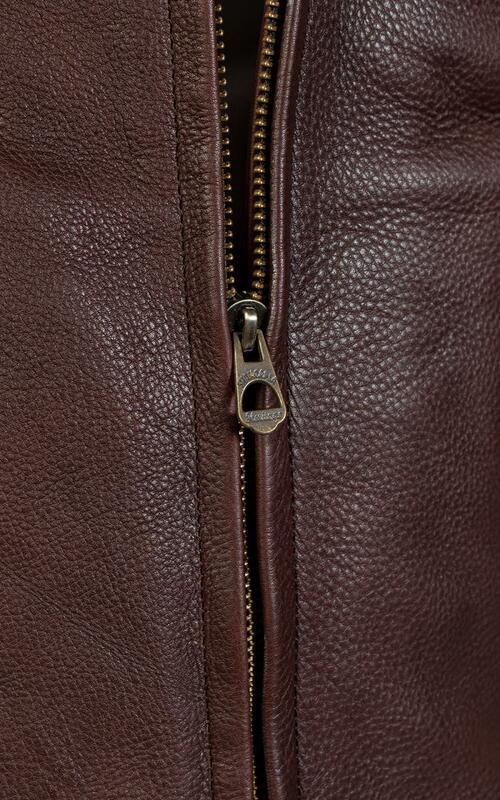 The zippers are made out of metal antique brass with engraved mark. The attention to details makes it a rare and authentic leather jacket. Designed for bikers, rockers and gentlemen. The name “Varenne” is a tribute to the legendary Italian horse, the best Racer of all times. The Cafecto hybrid combines the sleek silhouette of a café racer with the strength and durability of a signature Perfecto. Streamlined yet solid, this 24” jacket crafted from thick, heavy steerhide leather features a classic café-style collar with logo-free snaps and an asymmetrical front zipper. The sleeves, hand-warmer pockets and the chest pocket all have zip closures, and you’ll find a small change pocket with a logo-free snap above the right hip. The bi-swing back allows for easy movement without the extra bulk of underarm footballs. Satin lining provides comfort and ensures long wear against the rattle and roll of the open road. Stars on the epaulets add a subtle, military-esque flourish. Since this is a slim fitting jacket, we recommend ordering a size larger than your usual size. Schott NYC 是美国经典皮衣品牌，原装美国制造的每一件Schott NYC夹克都承载了公司90余年的传奇历史, 即历经两次世界大战和18位美国总统的更替. Schott NYC的产品代表了原汁原味的美国精神. 出色的质量, 创新而充满个性的设计使其不仅深受欧美军方的青睐, 更是包括马龙.白兰度和詹姆斯.狄恩等传奇明星的挚爱. 正因为如此, Schott NYC已经成为代表美国文化的一面旗帜. Schott NYC的发展史是一部美国梦的真实写照:1913年, 当福特公司的第一部T型车刚刚开始在纽约的大街上流行起来之时, Irving 和Jack Schott这对俄国移民兄弟, 怀着对美国梦的美好幻想在曼哈顿的一个地下室里开始了他们的传奇创业历程. 他们起初制作雨衣, 并靠街头小商贩的上门推销来销售他们的产品. 仅仅在两年之后, 他们的生意就已经发展到了在Staten岛上开设了一家工厂, 并把他们生产的夹克以家族的姓氏和Irving Schott本人最喜爱的一种名为Perfecto的雪茄组合在一起命名. 这就是著名的Schott Perfecto系列夹克. 在20世纪中期, Schott NYC生产的夹克因其革命性的设计很快引领了当时的户外穿着潮流, 并成为世界上第一款使用拉链的夹克. GMT+8, 2019-4-23 21:58 , Processed in 0.383876 second(s), 41 queries , Gzip On.